AIM: To observe and comment on the different physiological process in plants. A. 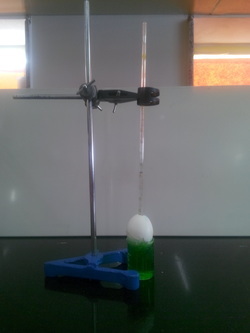 Experimental set up to demonstrate osmosis by egg osmoscope. The egg osmoscope has been filled with 10-15 % sugar solution. Due to endosmosis,level of sugar solution rises in the capillary tube. B. 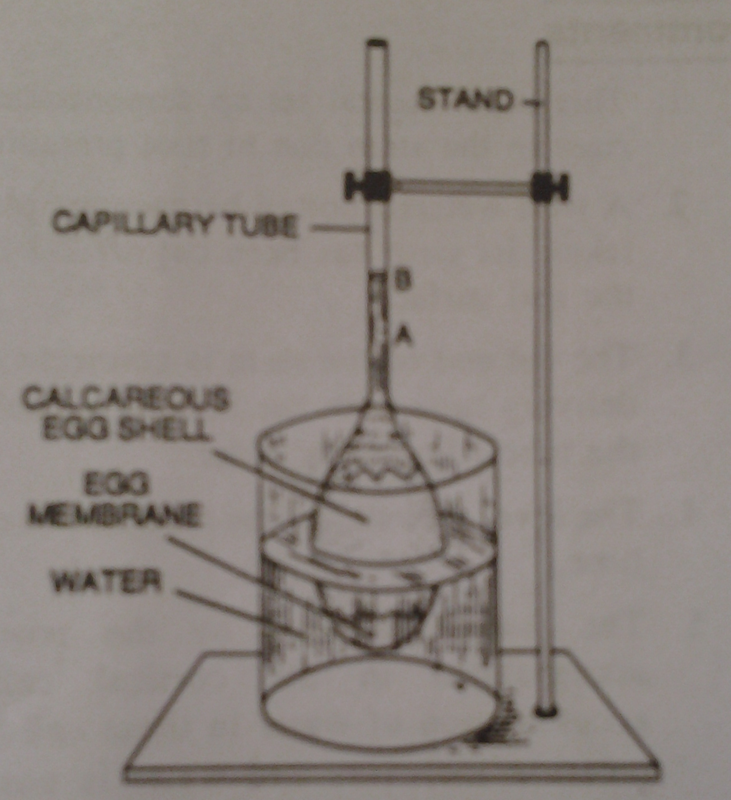 Experimental setup to demonstrate osmosis by thistle funnel method. The thistle funnel is filled with hypertonic solution & is placed in beaker filled with water. The initial and final level of solution is shown in the thistle funnel. 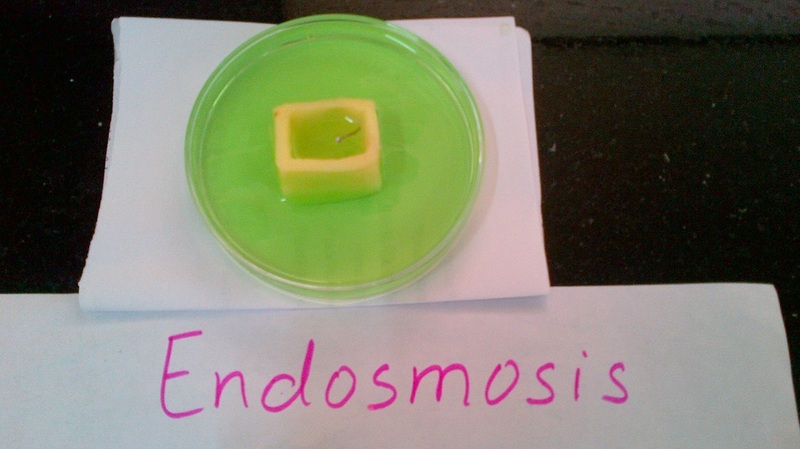 C. Experimental set up to demonstrate the process of endosmosis by potato osmoscope. Peeled potato with cavity which has been filled with 10 or 15% sugar solution is kept in a petridish in water to which 1-2 drops of red ink or safranin has been added. A pin has been inserted to the wall of the cavity of potato tuber to mark the original level of sugar solution in it. The grapes have been kept in a concentrated solution of sugar/salt. The skin of grapes act as a semipermiable membrane. Thus the water within the grapes moves out by exosmosis making the grapes flaccid. A. Experimental setup to demonstrate the phenomenon of transpiration. Droplets of water seen in the inside bell jar. B. 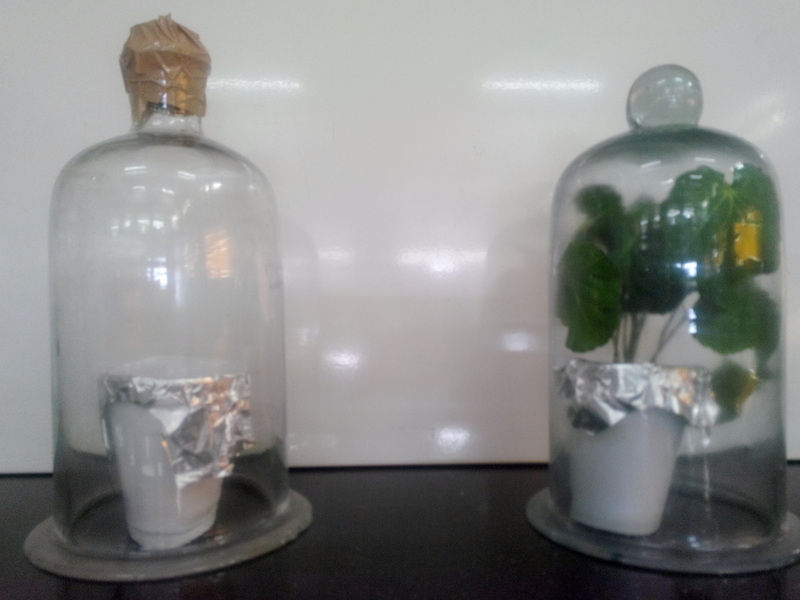 An experimental set up to demonstrate unequal transpiration from the two surfaces of dorsiventral leaves. Cobalt chloride fixed on both surfaces of the leaf. Paper turns faster on lower surface. 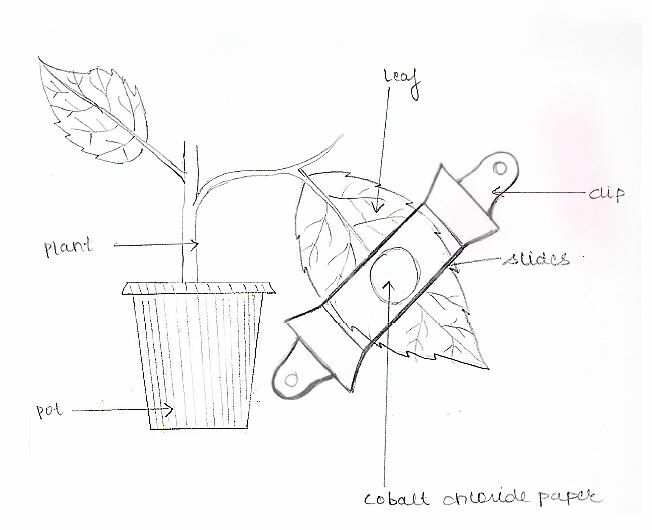 Leaf attached to the potted plant, cobalt chloride paper on both the sides of the leaf, glass slides covering the CoCl2 paper, rubber band or clips fixing the glass slides. 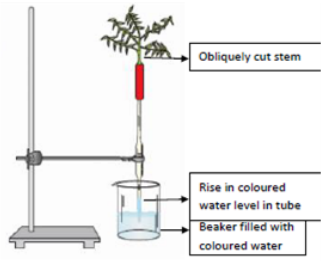 C. An experimental set up to measure the rate of transpiration by Ganong's potometer. A healthy twig cut under water is fixed at the mouth of wide tube and an air bubble has been inserted in the horizontal tube,the end of tube is kept in water in a beaker. As time goes on air bubble moves in the tube due to suction caused by transpiration. Rate of movement of bubble indicates the rate of transpiration. D. An experimental setupp to show transpirational pull. 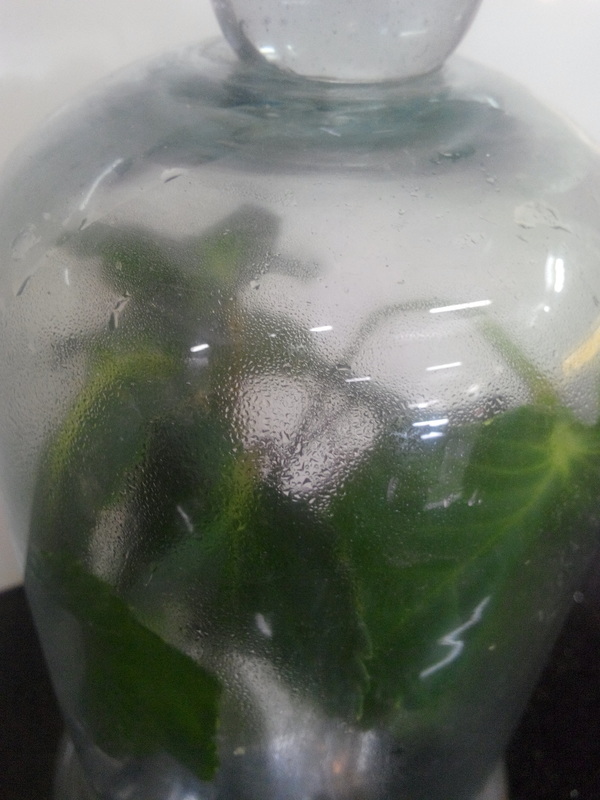 Experimental set up showing suction due to transpiration. An obliquely cut twig of a plant is inserted into the rubber tube attached with a pipette which is filled with water by suction. The other end (nozzle) of the pipette is kept in the beaker filled with colored water and the set is fixed with burette stand. Initially when the experiment is set up ,coloured water column in the pipette is observed. After about an hour coloured water rises in the pipette. A. 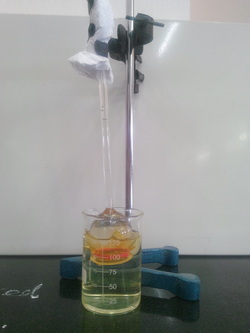 An experimental set up to show that oxygen released during the process of photosynthesis. Bubbles are seen in test tube. An aquatic plant Hydrilla is present. Aquatic plant correctly drawn, cut end of the shoot in the stem of funnel (upwards), shape of the leaf. Inverted funnel, stem of funnel below the level of water. 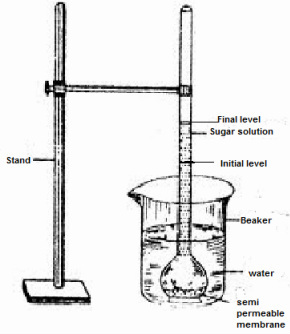 Inverted test tube rests on the funnel. 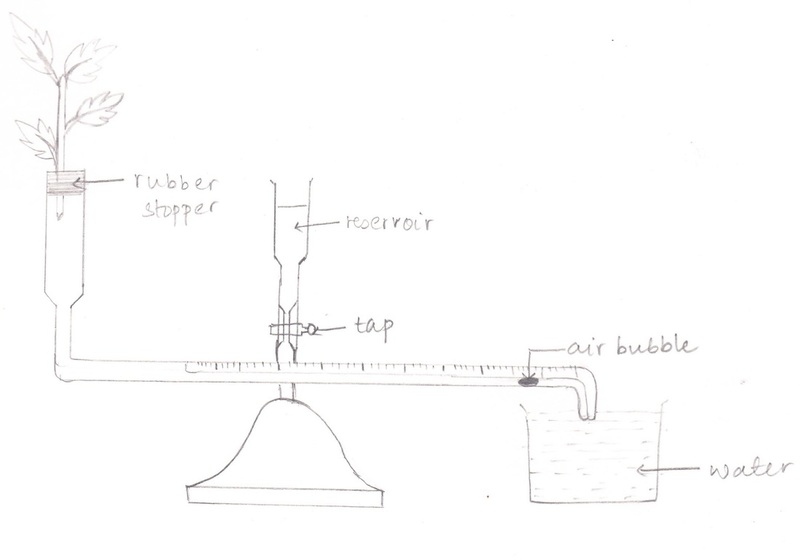 Oxygen bubble, water, light source, Hydrilla, beaker, funnel, test-tube. B. An experimental set up to show that CO2 is essential for photosynthesis by Moll's half leaf experiment. KOH (absorbs all the CO2) present in the bottle. Leaf part inside the bottle shows no starch when tested with iodine. Show leaf connected to the potted plant. Show half of one leaf in the bottle/conical flask. Show KOH in the bottle. Leaf ,wide mouthed bootle or flask, KOH solution. C. An experimental set up to show that light is essential for the process of photosynthesis. 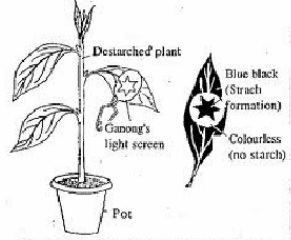 A destarched plant is kept in light for some time with Ganong's photo screen placed on leaf. After some time the leaf with photo screen is detached from the plant and tested for the presence of starch. Covered portion of the leaf will give negative iodine test. The region of leaf which was exposed to sunlight will give positive iodine test.